It was the fastest U.S. tracked armored vehicle until the turboshaft-powered M1 Abrams main battle tank appeared decades later. The speed was attained by keeping armor to a minimum, and by equipping the relatively small vehicle with the same radial engine used on the much larger Sherman tank. 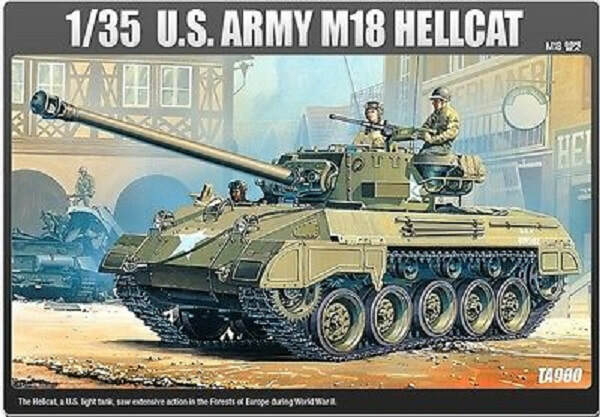 The Hellcat was the most effective U.S. tank destroyer of World War II. It had a higher kill to loss ratio than any tank or tank destroyer fielded by U.S. forces in World War II. When the Tank Destroyer Force was organized in 1941, their commander, Lieutenant Colonel (later General) Andrew Davis Bruce envisioned the units being equipped with something faster than a tank, with a better gun but less armor to allow for speed, a cruiser rather than a battleship. He objected to the 3 inch M10 Gun Motor Carriage because it was too heavy and slow for his needs, and later on to the 90 mm M36 Gun Motor Carriage because it was essentially an M10 with a bigger gun. The United States Ordnance Corps made several failed attempts to provide said vehicle using the weapons (the 37 mm, 57 mm, 3 inch, 75 mm and finally the lightweight 76 mm of 1942–1943) and technology available, including mounting the 3-inch gun on the fast M3 Light Tank chassis. The M18 was the end product of a long line of research vehicles aimed at providing the desired machine. In December 1941, the Ordnance Department issued a requirement for the design of a fast tank destroyer using a Christie suspension, a Wright-Continental R-975 radial aircraft engine, and a 37 mm gun. Two pilot vehicles were to be built. Interestingly, what would become the M18 originated in Harley Earl's design studio, part of the Buick Motor Division of General Motors. Previously, basic designs for other kinds of vehicles had mostly originated from within the Ordnance Department. Buick's engineers used a torsion bar suspension that provided a steady ride. Though it weighed about 20 tons, the Hellcat was capable of traveling upwards of 45 mph. Its power came from Wright R-975, a nine-cylinder, 350-to-400-horsepower radial aircraft engine, paired to a three-speed 900T Torqmatic automatic transmission. Changes to the specification mean that the first pilot – the 57 mm Gun Motor Carriage T49 – was built with the British (57 mm) QF 6-pounder gun instead of the 37 mm and a torsion bar suspension instead of the Christie suspension. 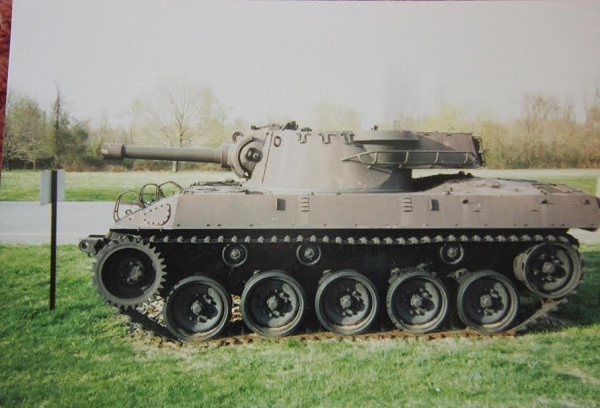 It was tested in 1942 but the army wanted a heavier gun – the same 75 mm gun M3 as used on the M4 Sherman medium tank. The T49 project was cancelled and the second pilot was built with the 75 mm gun as the 75 mm Gun Motor Carriage T67. This met approval, but in early 1943 the army requested a more powerful gun – the 76 mm gun M1 under development for the Sherman. 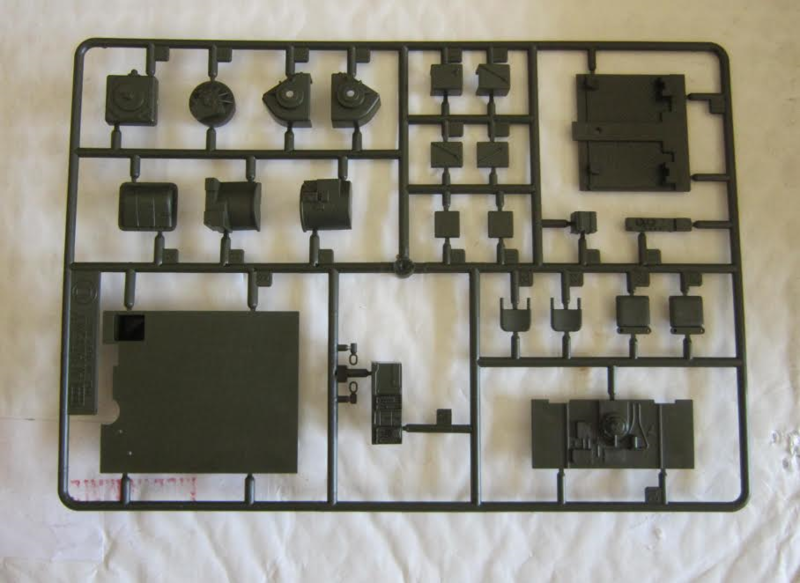 Six pilot models – as the 76 mm Gun Motor Carriage T70 – were built with this gun. The trials of these models led to a new turret and changes to the hull front, but the design was otherwise accepted for production, which began in July 1943. Once developed, the Hellcat was tested in the same manner as passenger cars before and after it, at the General Motors Milford Proving Ground. Top speed testing was done on a paved, banked oval and ride quality tests were done over specially developed stretches of bumps. The M18 also required tests of its ability to ford six feet of water, climb small walls, and ram through structures. The first models of the tank destroyer were tested by the US Army's 704th Tank Destroyer Battalion. The unit had originally been trained on the M3 Gun Motor Carriage (a 75 mm gun installed in the bed of an M3 half-track). 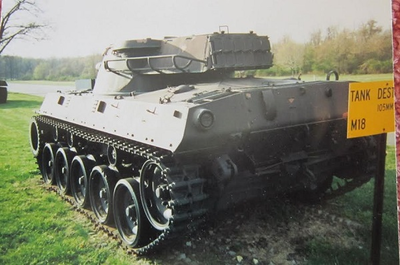 Despite its T70 prototypes requiring several improvements, the 704th had a "superlative" testing record, and the unit was later issued production Hellcats after many of their suggestions were integrated into the vehicle. The testing phase of the Hellcat proved that teamwork was an essential element of the new light tank destroyer units, and replaced the fixed, rigid structure of other units with a much more flexible command structure that allowed adapting to more complicated tasks. Academy is an old prolific model company based in Seoul, Korea. They manufacture all manner of model subjects in the popular scales. The kit comes in a large shrink-wrapped tray and lid type box. The box art shows a Hellcat on a city street. It is overall olive-drab with a white star on the bow and turret sides. On the rear of the hull sides is white U.S.A. over serial no. 40145192. The driver is looking out of his hatch and 2 other crewmen are posed as one looking out of the turret top hatch and the other wearing a steel helmet and manning the external machine gun. The other crewmen are wearing leather helmets and goggles. In the background there are 2 G.I. 's examining a knocke-out German tank. On the bottom of the box art there are features listed: Highly detailed hull, turret and bogies. Plentiful of accessories. Fully detailed interior of transmission and crew compartments. 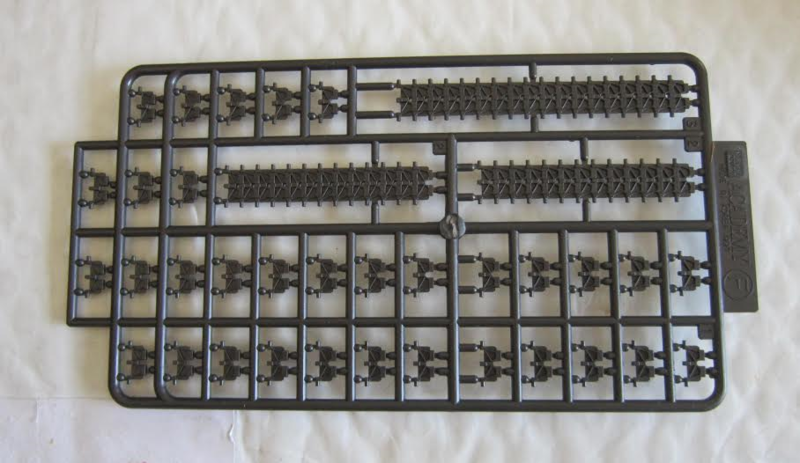 Choice of one piece flexable tracks or individual injection tracks. ​One side panel has 4 color walk-around type photos of the model made up. ​The other side panel has a color photo of 2 Hellcats. One has a white star that is in a circle on the nose. This is followed by "Not suitable for use by children under 36 months (3 years). 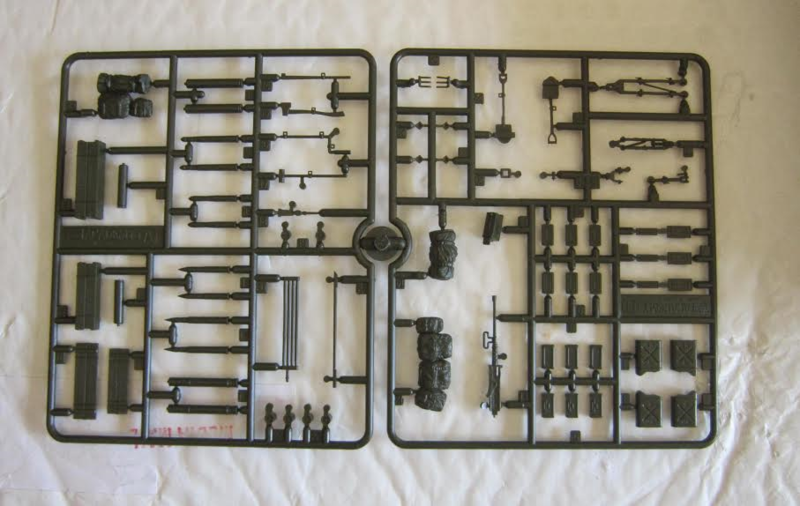 The copyright date of 1997, MADE IN KOREA, followed by - Contains one unassembled model kit and easy to follow pictorial instructions. Paint and cement are required to complete the model as pictured on the box art. Kit is suitable for ages 10 to adult. Scale is 1/35th. ​ This is all in 6 languages, including English, labeled with color illustrations of the flags of the countries that speak those languages. 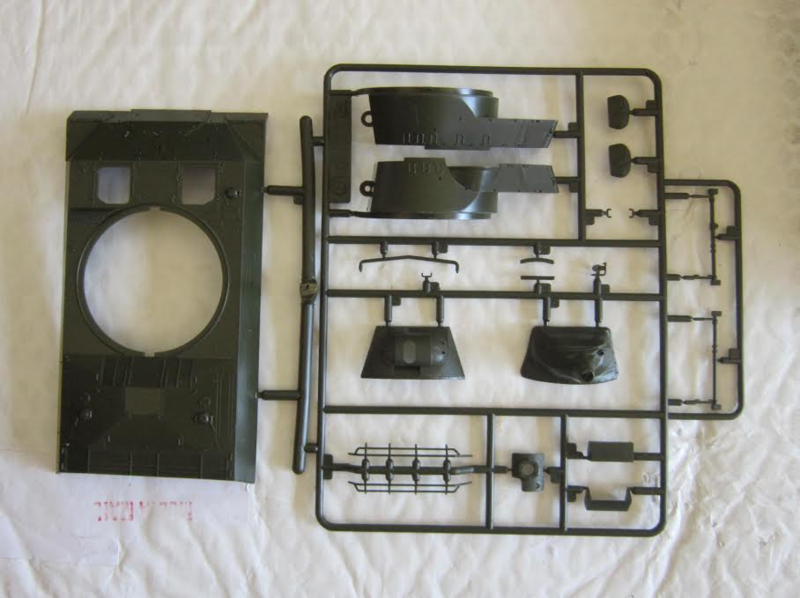 The kit contains 7 dark-green trees, a dark-green hull tub, black vinyl tracks and individual injection molded tracks, poly caps, length of string, decal sheet and instructions in 5 sealed clear cello bags. The instructions consists of a staple-bound booklet of 16 pages in 8 1/2" x 12" format. 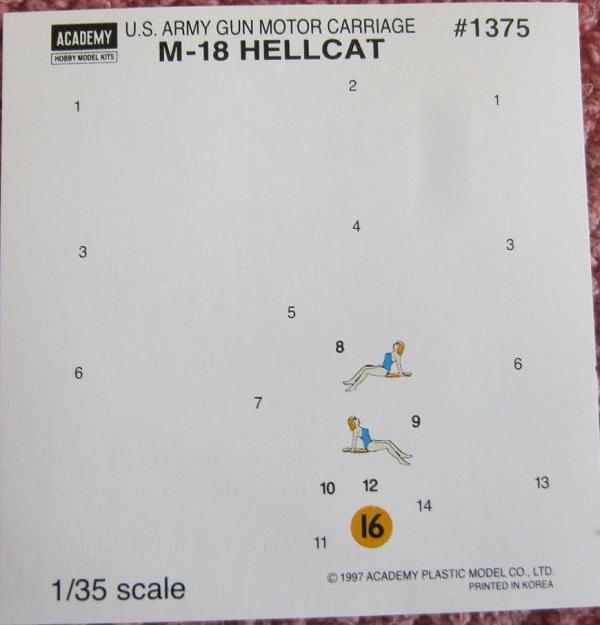 Page 1 begins with a black and white repeat of the box art over specifications for the Hellcat in English and Korean. Page 2 has international assembly symbol explanations. At the bottom of page 2 through to page 14 there are a total of 25 assembly steps. 1. 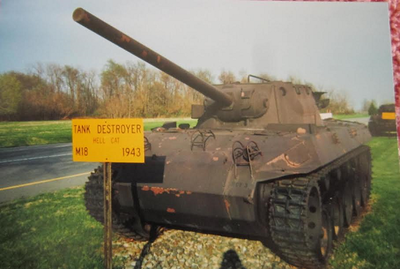 A Hellcat in overall olive-drab with a white star on the turret sides and top of the turret rear bin and on the front and rear of the hull. There is a image of a gal in a red bathing-suit on the front end of the sides of the hull, followed by a white "I don't want A" and U.S.A. 40145192. It is the box art subject. This tank is as it was seen in France in September of 1944. 2. A Hellcat in overall olive-drab with a white star on the sides of the turret and rear of the hull and a white star in a circle on the bow, with white 9609-V followed by B-10 and "Dorothy" down the sides of the hull. It is as it was shown in Germany, December 1944. ​Page 16 is the parts tree illustrations. 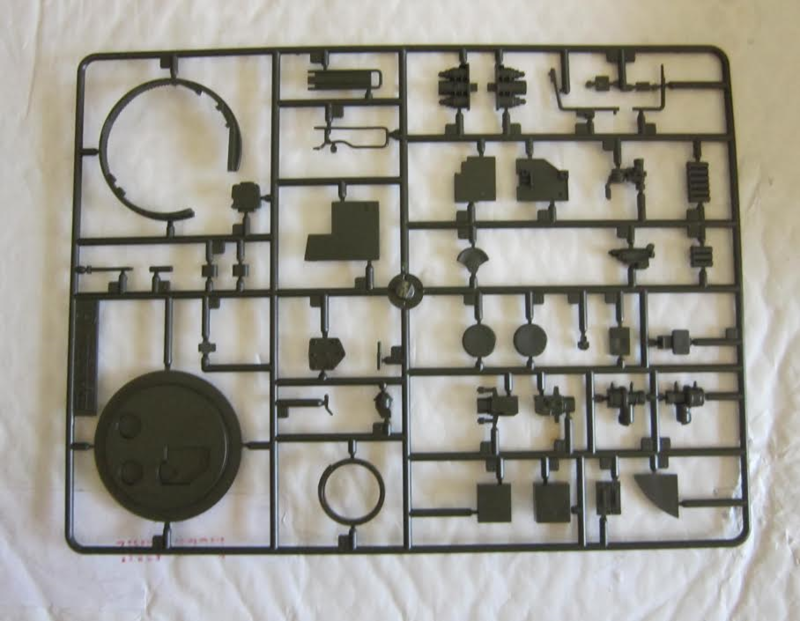 ​Dark green letter C tree holds: hull rear wall, alternate gun barrels and their breeches, hatches etc. 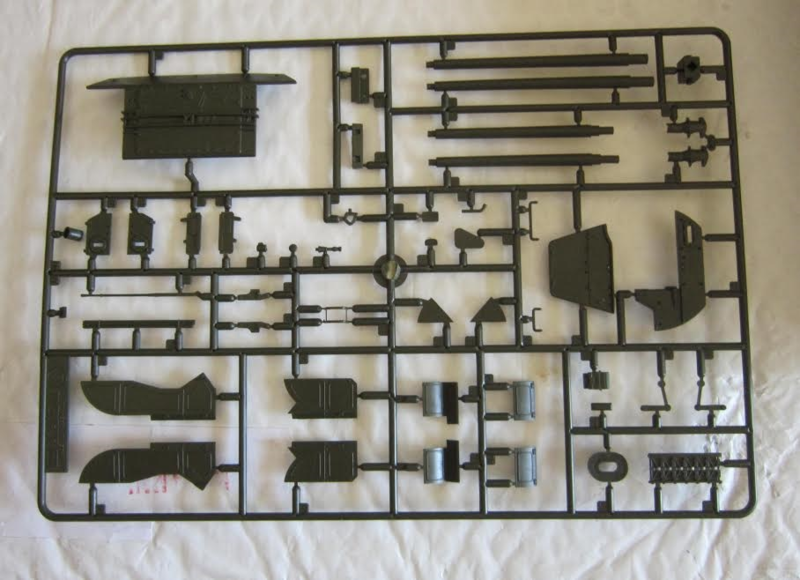 (47 parts) 1 part is labeled as being excess and not needed to complete the kit in the parts trees illustrations. ​There are 2 identical dark green letter E trees. They hold: road wheels, drive sprockets, bogies etc. 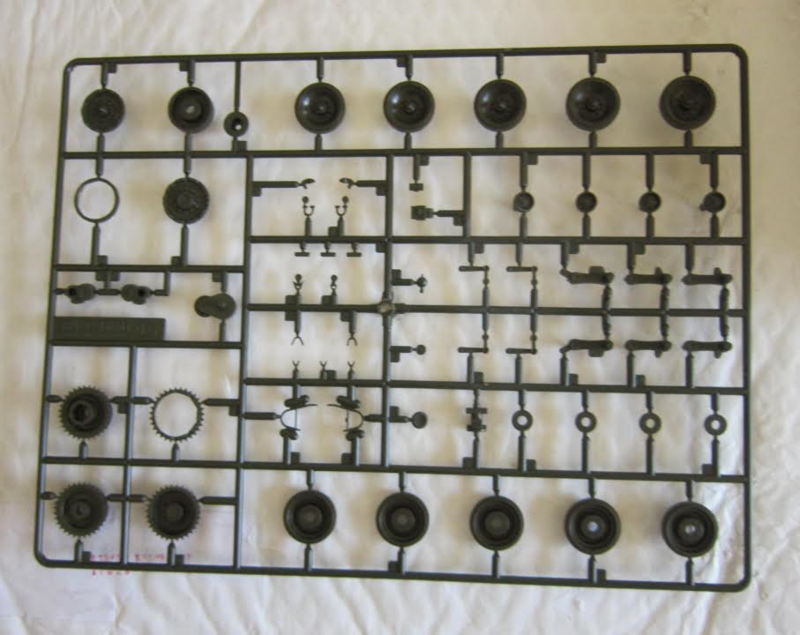 (64 parts) 6 parts are labeled as being excess and not needed to complete the kit in the parts trees illustrations. The poly caps to mount the road wheels and drive sprocket. ​There 2 runs of the alternate black vinyl type treads. 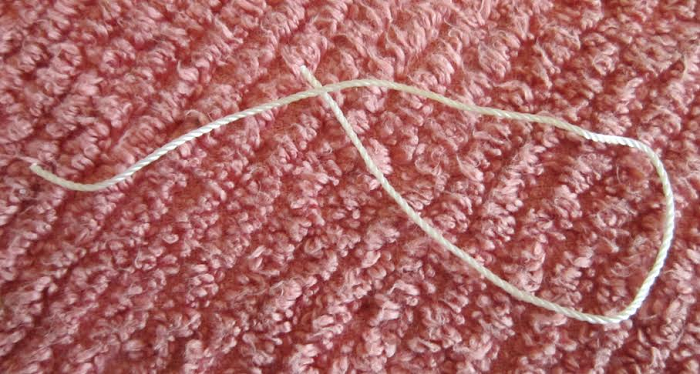 ​A length of white string is in the kit for tow cable use I assume. The one piece lower hull. Some photos of the M18 on display.